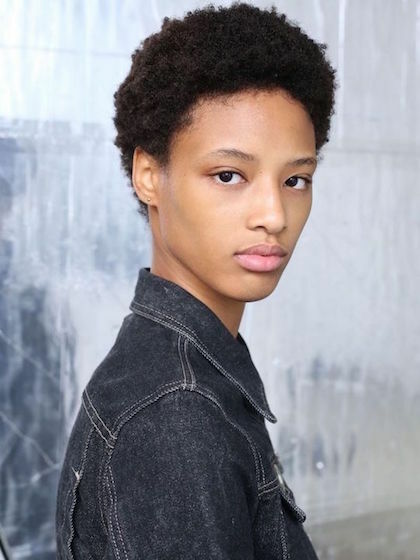 This past spring, AMDA alumna Janaye Furman made history by becoming the first African American woman to model the opening look for Louis Vuitton. We caught up with Janaye to discuss life after Louis Vuitton and her future plans as a model and performer. Q: Since walking for LV at Paris Fashion Week, how has your life changed? JF: After moving to New York for modeling I've become more independent, responsible and closer to my family. I have my own place in the city now, I'm able to travel, and I'm learning French. C'est exitant! Being far away from my immediate family has made me miss them more but it makes me realize how supportive and loving they are and I ended up getting to know other family members who live in New York as well. Q: In addition to modeling, you are also an actress and artist. Can you tell us about some of your previous roles/projects and which one you’d say had the most impact on you as a performer? Some of my past performances that come to mind were during my time at AMDA. The Trojan Women play, Live Aerial Acrobatics drawing, and my Café performance. I would actually say that the combination of these three things is what really made an impact on me as a performer. The Trojan Women was a play in Dr. Roxanna Stuart’s class in New York. Aerial Acrobatics was performed by a friend of mine for the New York Showcase (in which I also played a little bit of violin) and as she would pose I would draw her live in front of the audience. For the Café at AMDA’s LA campus, I performed a song I wrote that ended up being very well received by students on campus. These projects made such an impact on me because I learned to really value my versatility as an artist and that there is no limit to what I can create. Q: In a recent Vogue.com write up, the article states “For Furman, the achievement is an accomplishment, but for fashion, it serves as a reminder that even in 2017, there are still many barriers that have yet to be broken.” Can you speak more to this? I think people definitely forget or don't realize how much room we still have to grow. People tend to see the Paris show as a great change but disappointing that it took so long. Remembrance is important. I would like to add that to remember is not to dwell. I believe if we see it in a positive light, rather than dwell in the past, people will be more accepting of change. We should look forward to the future and make it better. Right now there's a change in the industry and there are more models of color than ever before. Hair stylists and makeup artists will have to adapt to models with natural hair and darker skin tones as well. Even in the years to come we should always strive for better representation of color; not only in fashion but in our society. Q: Where do you see your career in the next 5-10 years? I have so much I want to do. In the fashion industry I would like to still be representing Louis Vuitton and I plan to work with more designers including being a Victoria's Secret Angel. I'll have my own fashion line and/or collaboration with another designer. With acting I see myself in movies and behind the scenes writing, directing, producing, looking into cinematography. I also plan to be involved with music, art, dancing, stage combat and mixed martial arts. Most importantly I will be at a point in my career where I can inspire more people, give back to my family, and be a part of projects to help the environment and people in poverty. I also hope to make history again! Q: What advice would you give to current students at AMDA or anyone considering pursuing performing arts professionally? Don't wait to give your all and remember that you're competing with yourself, not others. If you test the waters at first everyday by the end of the day you will have just begun. Jump right in and accept the fear that you feel when you are out of your comfort zone. One example I could give of this is improv. Improv always made me nervous because it was the class where you have no idea how things will end. For a long time I would try to control everything and make sure I didn’t say anything stupid and that was exactly my downfall. One day I decided to face my fears and I volunteered to go first. That was the first time I ever felt good doing improv and it got a great reaction. Don't think about what might be wrong. Think about what you would want to see happen and take in the notes from the teachers. They will say things that will stick with you forever. Q: Can you tell us how your time at AMDA helped prepare you for your career today? AMDA taught me what I'm capable of and gave me understanding of who I am. Once I understood myself and how I approached a situation, I was able to see how I can use a part of my personality and use my emotions to give depth to a role. With that, I can change my approach to create a well developed character that is different from myself. Additionally, I have learned how to be in the right state of mind before I enter an audition room.